Public hospitals were shut down in Greece as workers began a 24-hour strike on May 20 to demand delayed pay and more hospital personnel. 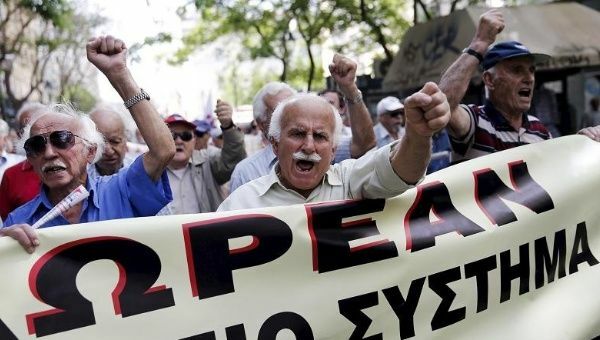 Medics and nurses demonstrated in front of the health ministry in Athens and were joined by pensioner associations, TeleSUR English said on May 20. In solidarity with the demands of the health care sector, workers from other public services joined the strike, bringing the country to a standstill. Healthcare workers say that austerity cuts have severely damaged public hospitals due to a lack of professional staff and funding. The International Monetary Fund had requested to previous Greek governments merge public hospitals to reduce costs spent on personnel. Protesters also occupied the German multinational insurance company Allianz on May 20 in protest against Germany's policies towards Greece.